The oldest and largest tree at White Haven, a majestic red oak (Quercus rubra). 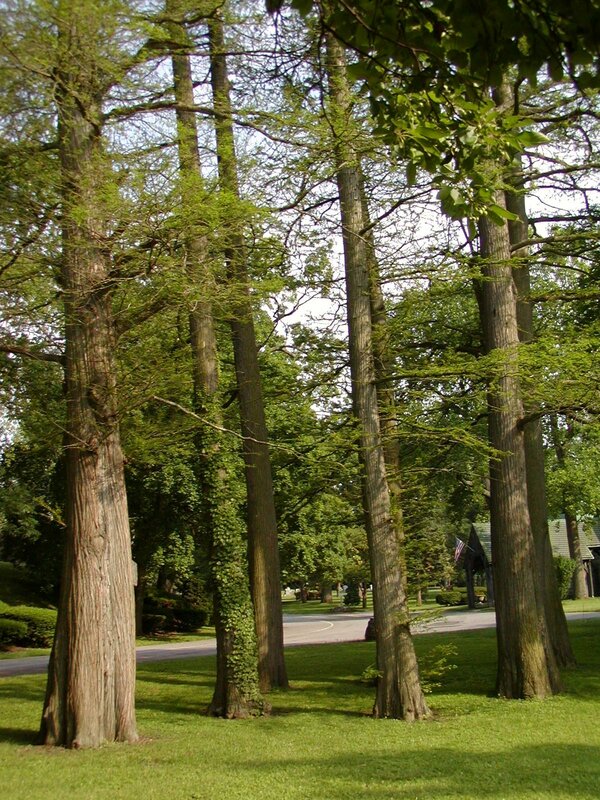 The tree collections of cemeteries and memorial parks make a significant contribution to urban forests. Recently we learned more about the Certified Level 2 urban arboretum that is Green-Wood Cemetery in Brooklyn as part of the blog profile of Green-Wood Director of Horticulture and Curator Joseph Charap. White Haven Memorial Park in Pittsford is a Certified Level 1 Arboretum, soon to be applying for Level 2 Certification. The 170-acre White Haven Memorial Park in Pittsford is a park for all people. Walkers and runners are welcome, bicyclists and hikers are welcome, dogs are welcome. Birders can come do their early morning thing, including observing Eastern bluebirds in the Park’s dedicated nesting area. The entrance sign even says “Geocachers welcome.” One need not have a loved one buried there to enjoy the beautiful natural assets of White Haven—including formidable horticultural assets. There are more than 150 different tree species in the developed areas alone, with dozens more species yet to be inventoried in the Park’s 70-plus acres of forest. The oldest and largest tree is a red oak (Quercus rubra) in the center of the developed Park. Director of Horticulture Gary Burke is partial to a large shagbark hickory (Carya ovata) and Park President Andrea Vittum loves the large Nootka cypress (Cupressus nootkatensis). Other interesting specimens include Kentucky coffeetree (Gymnocladus dioicus), Katsura tree (Cercidiphyllum japonicum), Japanese snowbell (Styrax japonicus), tupelo (Nyssa sylvatica), yellowwood (Cladrastis kentukea), American fringetree (Chionanthus virginicus), goldenchain tree (Laburnum anagyroides), paperbark maple (Acer griseum), and six different kinds of beech trees. There are five mature ash trees in the developed collection that are being micro-injected to project the trees from Emerald Ash Borer. Newly planted trees get trunk protection via corrugated plastic tubes, to protect the tender cambium from rutting bucks. With the assistance of consultant Jerry Bond from Urban Forest Analytics LLC, the City of Batavia recently completed their first comprehensive Tree Management Plan. It was funded through Round 12 of the Environmental Protection Fund (EPF) Cost-Share Grant program, administered by NYSDEC. Over the last five years, a number of complementary inventories of Batavia’s public trees have been made. A full inventory of street trees was completed in 2014 by Cornell University’s Student Weekend Arborist Team (SWAT) under the local direction of Fred Cowett and the general oversight of Prof. Nina Bassuk. In October of 2016, Jerry Bond of Urban Forest Analytics LLC conducted a sample inventory to estimate the maintenance needs of a large number of trees left unrated by SWAT, and to confirm the status of the street tree resource more generally. In June of 2016, Bond did a full inventory of the City’s park trees. Village Green and the Red Hook Town Tree Commission are pleased to share these urban forest management plans. Longtime Red Hook environmental advocate Brenda Cagle shares some background with us. The Town of Red Hook Forestry Management Plan is an example of a volunteer-created plan for a small community (pop. 8240). The Red Hook Town Tree Commission created the plan in 2013 after the completion of a street tree inventory conducted by the Hudson Valley Specialized Weekday Arborist Team (SWAT) and funded by a NYSDEC Cost-Share Grant. This plan is very readable and informative. Colorful and inspiring pictures are sprinkled throughout and keep the reader’s attention. In addition to guidelines for budgeting, planting, maintenance and outreach, the plan includes the entire street tree inventory, a master tree list, tree planting instructions, and a resource page. The Village of Red Hook Forestry Management Plan (2004) is an another example of a volunteer-created plan for a small community (pop. 1961). In September, 2003, a street tree inventory was conducted by what was then called the Cornell Community Forestry Outreach Team. Village Green, the Village of Red Hook’s tree committee, created the forestry management plan the following spring. Some of the inventory findings—such as the lack of species diversity and the need for immediate maintenance or professional consultation—formed the basis of the plan. The Village used the plan to prioritize tree maintenance work and make informed planting choices. A second street tree inventory, funded by NYSDEC Cost-Share Grant dollars, was conducted in 2009. The results showed greater species diversity and lower maintenance needs, illustrating the value of having and plan and following it. This Village of Red Hook Plan would be most useful to those who have recently completed an inventory. Brenda’s at center, wearing sunglasses, with other members of the proud Red Hook Village Green Committee. Can you tell us about your childhood influences that foreshadowed getting interested in conservation, trees, and urban forestry? When and how did you first get involved with NYSUFC? In what ways have you participated, and what has your involvement meant to you? Using data from the TreesCount! 2015 inventory, NYC Parks brings us the interactive New York City Street Tree Map, the world’s most extensive, accurate, and detailed tree map. With the Map, anyone can access data about any street tree in the City. Users can learn about the inventory as a whole, including its quantifiable ecological benefits and predominant species, they can mark trees as favorites and share them with friends, and they can record their tree stewardship activities. They can find out ecological benefits of each individual tree; for instance, the Japanese pagoda tree at 213 E 73rd Street, provides the following benefits. The interactive New York City Street Tree Map that was created from that data is a marvel. It will surely inspire more of its kind. Round 13 of the NYSDEC Urban Forestry Grants Program was announced on December 22, 2016. NYSDEC Commissioner Basil Seggos has announced the availability of $2.3 million for Round 13. Applications are due by March 1, 2017. Awards range from $11,000 to $75,000, depending on municipal population. Municipalities with populations of 65,000 or greater are eligible for grants up to $75,000. Towns with populations less than 65,000 are able to apply for up to $50,000. For inventory and management plan grants, no match is required. For planting and maintenance grants, there is a required 25% match. These grants are made available through the Environmental Protection Fund to municipalities, nonprofits, soil and water conservation districts, school districts, community colleges, Indian nations or tribes, public benefit corporations, and public authorities. A free webinar about the grant application process will be offered on Thursday, January 5th at 2 p.m. Registration is required. To see the instructions and application, Go to the NYS Grants Gateway then go to Browse Opportunities > DEC > 2016 Urban and Community Forestry Grants Program (Round 13)- Tree Planting or Tree Maintenance Projects. At TreesCount! 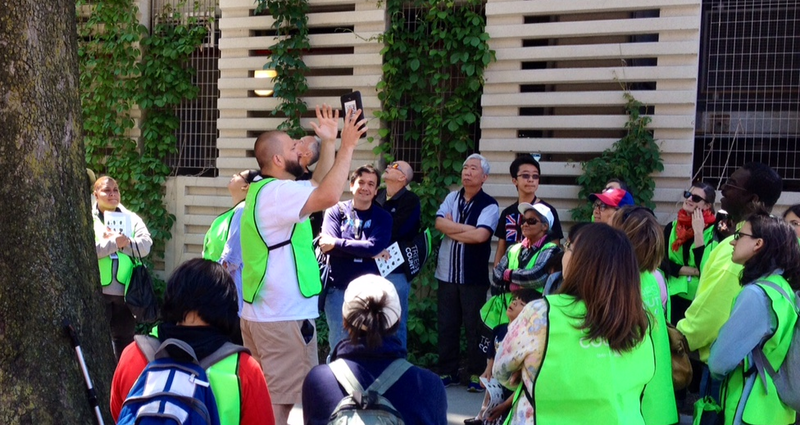 2015 orientation events, NYC Parks staff and their partners met with volunteer citizen scientists to talk about how the ongoing census helps the City, how citizen scientists can participate in the data collection, and how the census methodology works in the field. TreesCount! 2015 is the third decadal inventory of NYC’s street trees. This is the first tree census to use volunteer citizen scientists to be the primary data collectors. Individuals who have mapped went through a full training process with NYC Parks Census staff, mapped in “events” with other volunteers or mapped independently. Community partners ranging from environmental non-profits, business improvement districts, youth groups and community boards have also played a key role in training and engaging volunteers to map their neighborhoods. Volunteers have mapped 200,000 trees, 30% of the city, since May 2015. Here, Nyack Tree Committee Chair Marcy Denker discusses the tree inventory recently completed in her Village. You can see the full tree inventory report here, and the key findings from the inventory can be seen after Marcy’s narrative. Foresters Allison Huggan and Carl Koehler (yellow jackets) of Davey Resource Group with Nyack Village Trustee Doug Foster, Mayor Jen White (center), and Tree Committee Chair Marcy Denker. When the Village of Nyack organized a Green Infrastructure Roundtable to address stormwater problems three years ago, tree planting and stewardship emerged as priority actions. The Village took the steps to become a Tree City USA the following year and received a NYSDEC Cost-Share Grant for a tree inventory. Completed in 2015 by Davey Resource Group (DRG), the inventory identified over 500 locations for tree planting on public land. That’s a lot of sites for a village of one-and-a-half square miles!